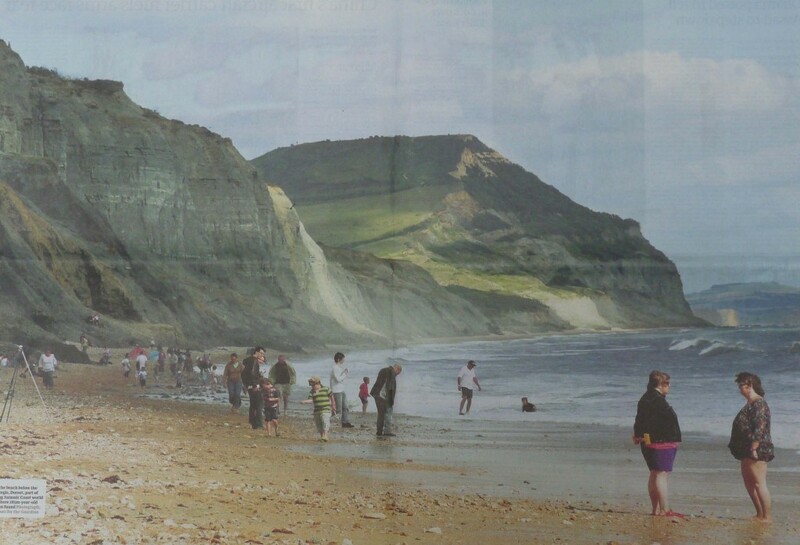 The caption, however began, ‘Visitors comb the cliffs at Lyme Regis……’. Lyme Regis is in fact two miles east of Charmouth, as was admitted in the correction column the next day. But the photo was taken about a mile further east. 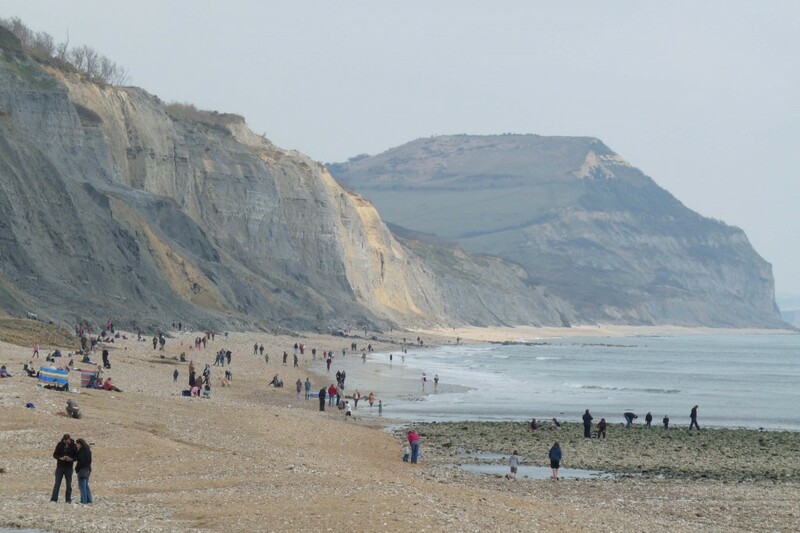 Charmouth beach has a lot more people on it in the middle of August, which I hope to show by a pic of my own below. Meanwhile I can confirm that society is not broken around here. Dorset police reported to our Neighborhood Watch, also on Thursday, that despite the National Disorder, they had made just three arrests. For incitement to riots. The local youths apparently are reading the social media but not taking to the streets. No shops have been trashed on our streets. I would have blogged on the riots were it not for the fact that my daughter got married on Saturday, 6 August, the day the riots took off, and I have been busy since then with visitors who stayed around because Dorset is a good place to take a holiday. Just found a pic I took myrself in 2010 from the same spot. It was taken in May before tthe holiday season getsr started. This is the first blog that I have written called Letter from Lyme Bay. It is now five years since I started blogging under the banner of Xcitybob.com. I changed the name after a few weeks, because I thought Xcity was meaningless to anyone who did not know the journalism course at City University London. The Daily Novel name came out of my ruminations about the origins of British journalism, particularly Charles Dickins, and how novels frequently tell more of the truth than much journalism. It seemed like a good idea at the time, especially when I found that the domain name was still available. But it now seems pretentious. And worse, missleading. Because I have not been writing fiction. I am trying the new name on for size. It will evolve alongsride some changes in style and direction.